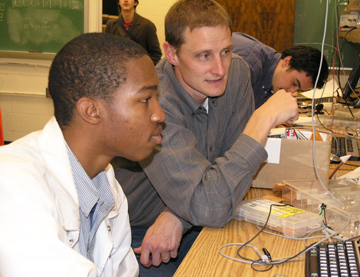 Instructor Christopher Schmitz works with ECE 101 student during lab. I-STEM's listserv provides subscribers with information about upcoming STEM education opportunities: deadline dates and funding information from funders, seminars, and other STEM-education-related events. To subscribe to I-STEM-NEWS, send an email to: listserv@listserv.illinois.edu, including only the following text in the body of the email: subscribe I-STEM-NEWS. The I-STEM Education Initiative is located in Noble Hall just north of the ARC on Peabody. Parking meters are available in the E-24 parking lot just west of the ARC. Champaign-Urbana MTD bus on campus. 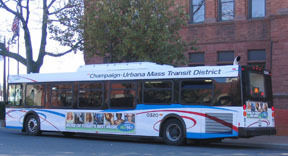 Champaign-Urbana Mass Transit District (C-U MTD) buses serve the local community and the University campus. Long distance transportation to the Champaign-Urbana area is provided by Amtrak trains, Willard Airport and other regional airports, and several bus companies. University bicycle racks have been strategically placed throughout campus. Biking is a convenient, fast, and inexpensive way to get around the large campus. The university requires permits for all motorcycles and mopeds, which must park in designated "Motorcycle Parking Permitted" areas. The closest area is on Sixth Street between John and Daniel Streets. Motorcycle parking areas are designated by stars on the campus map. Visit Campus Parking or call 333-3530 for further information. City 2-hour metered spaces run along Peabody Street, just south of I-STEM. Additional metered spaces are available in Lot E-24, just west of the ARC. The meters are enforced from 7:00 am-9:00 pm, Mon-Sat. The rate is 75 cents per hour. University parking lot E-24, which is located to the west of the ARC on Peabody. IIt contains a number of metered spaces, enforced Mon–Fri from 6AM–5PM. The rate is 75 cents per hour. University parking in metered or reserved spaces is free on Saturday and Sunday (unless the signs indicate otherwise; note that short-term red parking meters are never free). When organized I-STEM events provide parking for invited participants, I-STEM staff will communicate details directly to participants.